In December 2017, Tom, (not his real name) and his wife moved into the Indian Hills low-income apartment complex in Quincy, Illinois. He says by spring, as the warm weather approached, they noticed an increasing number of cockroaches. Since then, Tom says although he has complained several times over the past year and a half he has lived there, nothing has changed. “Once the winter was gone after us moving there, the roaches started appearing almost instantly, as soon as the cold subsided. Every single part of the house, they infested everything. Nothing's being done about it, which is a main concern for me because I have children there. I have a baby on the way, a baby daughter. Raising them in that kind of environment just isn't sanitary, and it isn't safe,” Tom said. “In my apartment alone, roaches will get into anything and everything, all of your electronic devices, anything, your decorations, your home décor, your furniture, your pillows, anything and everything they will infest.” Tom shows me the microwave in the kitchen where dead and live cockroaches are piled up behind the digital clock panel. “I had to throw my toaster away because it was filled with roaches. I went to make toast and looked down into the bottom of the toaster shafts, the bottom of the toaster was literally infested with roaches, moving with roaches. I turned it on and the smell of burning cockroaches filled the entire apartment within two to three minutes, and it was bad. They've infested my washer and dryer. They've gotten into the frame of my television.” The following video includes the voice of “Tom” as he describes the how he and his family live in his public housing apartment. 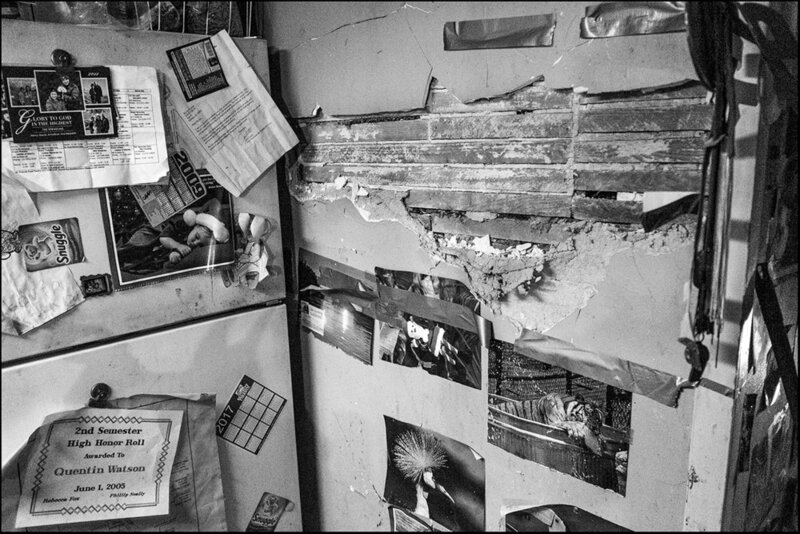 Melanie lived in Quincy’s Indian Hills low-income apartment complex for about 11 years. She says her complaints about broken appliances, black mold, a cockroach infestation, and excessive peeling paint went unanswered for years. While she always paid her rent, there were several occasions when she was late and she received a warning letter in August 2018. She then went to Jerry Gille, Executive Director of the Quincy Housing Authority, and complained about the cockroach infestation in her apartment. Gille says he remembers the conversation, but didn’t personally look into the apartment. When she was late with her rent in September and October, she was served with an eviction notice. By November, Melanie found another apartment and was ordered to pay about $800 in attorney and court fees. Gille said the eviction was a rent issue, but “based on everything I’ve learned, (since Melanie’s eviction) she had legitimate complaints.” Gille said at one point he planned to offer to stop the eviction process, but Melanie had already found another place to live. Foreground. A cockroach trap on the microwave near the stove is filled with dead roaches as Melanie prepares dinner for herself and her two children. A dozen cockroaches begin crawling from the stove as it heats up. Melanie says she has to re-clean her washed and put away dishes and eating utensils, before using them each time, because there no place to store the items to keep the roaches off of them. Like a monument to she and her children’s nightmare of living with a pest infestation at Indian Hills low-income apartments in Quincy, a dead cockroach rests inside the thermostat lens dial located in the living room of Melanie’s apartment. A wall near the baseboard heater in her daughter’s room is literally crawling with cockroaches. There are so many roaches not even bright light deters them. They simply don’t scurry away, but boldly remain in place. “You’re not allowed to live a normal life like this. My kids can’t have friends come over. Even my parents, you know, they don’t want to come over here, because they don’t want to see me and my kids living like this,” Melanie said. Looking around the kitchen, one can count a couple of dozen stationary cockroaches, as more scurry from place to place. The cockroaches are content to live in plain sight even in the daylight. “Along with the cockroaches, we have also had mice in our house. I currently buy two large cans of Raid from Wal-Mart, every paycheck, every two weeks, along with sticky traps for the mice and roaches. I buy four packs of those as well. Another really big issue in my apartment is that the paint on every wall, or in every room, is peeling. There's several layers of paint. It falls from the ceiling and off the walls. The bedrooms upstairs also have black mold that reoccurs every summer, due to the humidity. When you're in my kitchen, you cannot use the two back burners of my stove. They do not work, and I was told that as long as the front two work, that's adequate.” Some of the interior walls are crumbling, raising concerns about lead paint in the apartment. With fly swatter in hand, Melanie kills more of what seems like an endless number of cockroaches. Melanie says she must keep all food items in the 4 large tubs pictured, in an effort to keep the cockroaches out. Melanie says she reported the mold in her son’s bedroom to the director of maintenance and says the director’s response was to say she could have her maintenance men clean the mold for $25 an hour, or Melanie could do it herself with bleach and water. 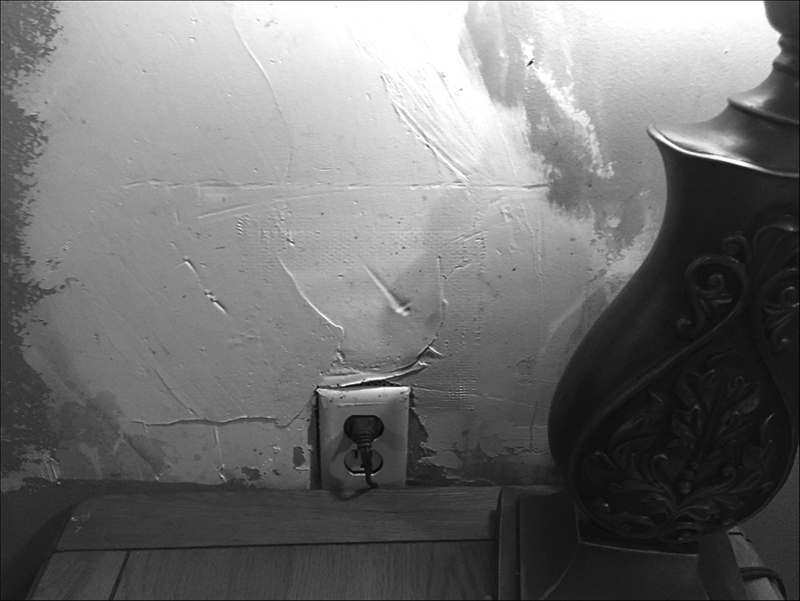 Melanie says the mold appears every summer because the apartment on the other side of the bedroom wall uses an air conditioner, which creates high humidity in her son’s adjacent bedroom. Melanie says despite asking on several occasions, the last time anything was painted in the apartment was one bedroom that was painted seven years ago. Large swaths of paint hang from the ceiling in her daughter’s bedroom. A sticker on Melanie’s refrigerator indicates her apartment was sprayed for cockroaches just 6 days prior to the photographs made of the cockroach infestation in her apartment. “Big River Pest Control does come in. They are hired to spray,” Melanie says. “They're under contract to spray every 28 days. When I come home from work, there is a sticky note on my fridge every 28 days, but I'm not here to see what they do. I have noticed that once they do spray, it seems like the roaches get worse. The last time that they sprayed was on October 30th, and prior to that, they sprayed on October 2nd. They also did a full treatment, the UV treatment, on my apartment in September, that was supposed to kill all the roaches,” Melanie said. The cockroach infestation is so bad, they have made their way into Melanie’s refrigerator. Chipped paint in the kitchen above the cabinets hides dozens of cockroaches, which creep in and out, both there and in several other areas of the apartment. The paint on the living room window sill chips easily, as rust and corrosion stain the walls. Melanie says, it’s impossible to clean the walls because the paint just peels off. There are several crumbling interior walls in the apartment, which adds to the unattractive living environment. According to Melanie, on October 31st, 2018, the Quincy Housing Authority filed paperwork to start an eviction process. “I was served it on November the 5th, 2019, on a Monday morning, at my place of employment, by the housing officer. I was called out from my desk by my boss and told that there was a police officer there to speak with me, who then, in front of my coworkers, let me know that I was being evicted from my place to live. It was very upsetting to me. It was very upsetting to have to later on tell my children that we have to find a different place to live, and my court date is on November the 8th at 2:00 PM, so I have three days in which to prepare a case to find myself somewhere to live.” Melanie says she feels the management is dismissive of legitimate complaints, and tend to blame the tenants for the cockroach issues. ”I just want to add that living in public housing, it's supposed to be a place that's safe. You're supposed to have rights as a tenant, and you're supposed to have staff that respects you. I have been told repeatedly that I live in a filthy manner, and that's why I have bugs, by the director of maintenance. She has told me that every time she comes in to inspect my house, my house is just filthy dirty, and that I need to learn how to clean a house better, and then I wouldn't have bugs. I don't feel like I live in a filthy ... You know, I don't feel like I live in filth, but it's also really hard to wash walls when the paint peels off of them, you know? And I feel like HUD should be held responsible to do more than a once a year check.” When looking around Melanie’s apartment, one sees the four large sealed tubs she keeps her food in, and the apartment looks reasonably clean. She limits all food to the kitchen area only. Melanie speaks with her son for a moment regarding school. Large sections of paint are chipping and peeling throughout the entire apartment, which creates hiding places for cockroaches. Gille says there are a number of factors contributing to the cockroach problem at Indian Hills including some cases of poor house-keeping, however, “I don’t believe Indian Hills tenants are inherently bad at keeping a clean apartment,” he said. We moved a disabled couple from one cottage here to another cottage over here. And it was a really bad ... That unit had gotten out of hand bad. And I got the pest control company owner down there. I said, "Look, man," I said, "There's only two apartments in this building. How is it that we have a bug problem," I said. "Neither one of these people are bad housekeepers." The larger issue is the way the buildings are laid out. “The reason why I think it’s so difficult in the line of work we do is because of the way the buildings are laid out. I think it’s that simple. You’ve got raceways….You’ve got raceways and waterlines that go from building to building.” Gille points to a building. “This particular building has 10 units, so if you go in and just light up a unit, what do they (cockroaches) do? They scatter. They go to the adjoining apartments. And they eventually filter back in. Pest control up to this point has been hesitant to treat an entire building at a time because of the difficulties involved in prepping an entire building at once.” Gille says four weeks ago they actually started with one building, but it’s too early to tell if it is going be effective. Live and previously smashed cockroaches greet those who walk into any of the bedrooms. Cockroaches are smashed each time one opens and closes an interior door. The dead roaches accumulate within minutes. After being evicted from her Indian Hills low-income apartment on November 29, 2018, Melanie finishes up cleaning on her last move-out day. She managed to find a small house to rent. Melanie says she and her children’s lives feel normal now that they have a clean and pest-free environment to call home. Editor’s Note: Three additional individuals living in Indian Hills apartments were interviewed. They also shared stories of cockroach infestations in their apartments. There are no simple or immediate answers to this problem. But it IS a problem. We're bringing awareness to the situation in hopes that something can be done to correct the issue. People shouldn't have to live in conditions like this. 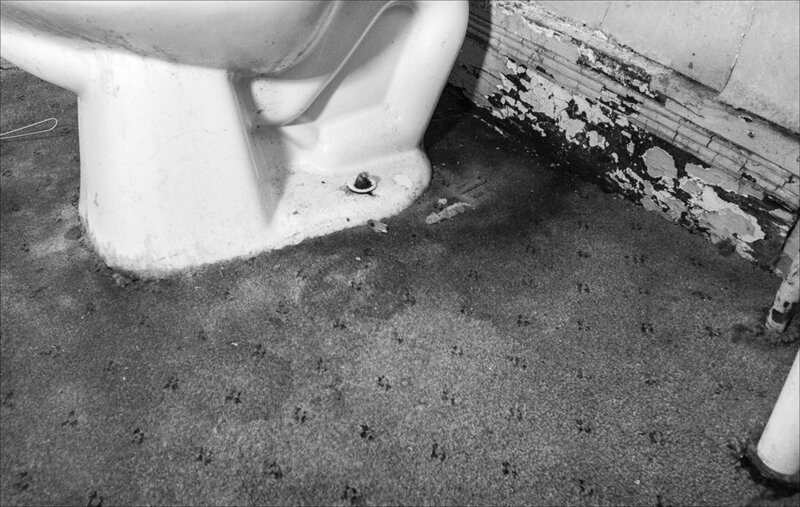 While some have suggested the reason for the infestation is because people are dirty, inspections are regularly done to maintain clean living environments in each apartment. (And, being a bad housekeeper transcends ALL income levels.) The quality of housekeeping isn’t the main reason there is a problem. Even the Quincy Housing Authority director has acknowledged the issue stems from a much larger problem. As always, the Quincy Illinois Poverty Project appreciates the public’s concern and we hope to generate enough awareness to help the director and his staff find appropriate avenues to stop this. Greg says he and his wife are subjected to mold and other major health-harmful issues in the apartment they rent on the north side of town. He says despite paying $500 a month rent, there are issues he has asked the landlord to repair for more than two years with no results. He says his landlord simply ignores him. 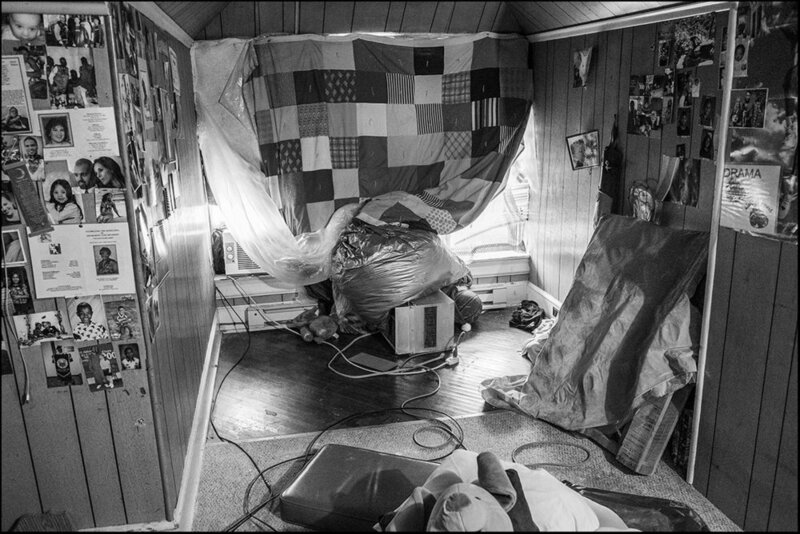 The following are photographs illustrating their living conditions. February 2019: In broad daylight, a mouse scurries across the rough plywood floor of the apartment. With exception of the kitchen floor, the entire flooring is exposed. Greg says the landlord said he would replace the carpeting 2 years ago, but never did. “I’m paying $500 a month for this, but can’t even walk around barefooted or with socks on, because of splinters,” Greg said. February 2019: The lighting fixture in the kitchen shows signs of faulty, burned wiring. Substandard housing is one of the major causes of house and apartment fires in Quincy. February 2019: The kitchen sink is literally separated from the countertop contributing to the number of rodents in the apartment. February 2019: The flooring under the kitchen sink is completely rotted, making way for rodents to enter the home freely. February 2019: Mold, mildew and water stains remain on the ceiling tiles from a leak in the bathroom above. A PROACTIVE rental occupancy health and safety inspection PROGRAM is desperately needed in Quincy, Illinois TO ADDRESS substandard housing and the victimization of women, children and the elderly. Hundreds of communities in Illinois have such inspection ordinances in place, yet our city doesn't. 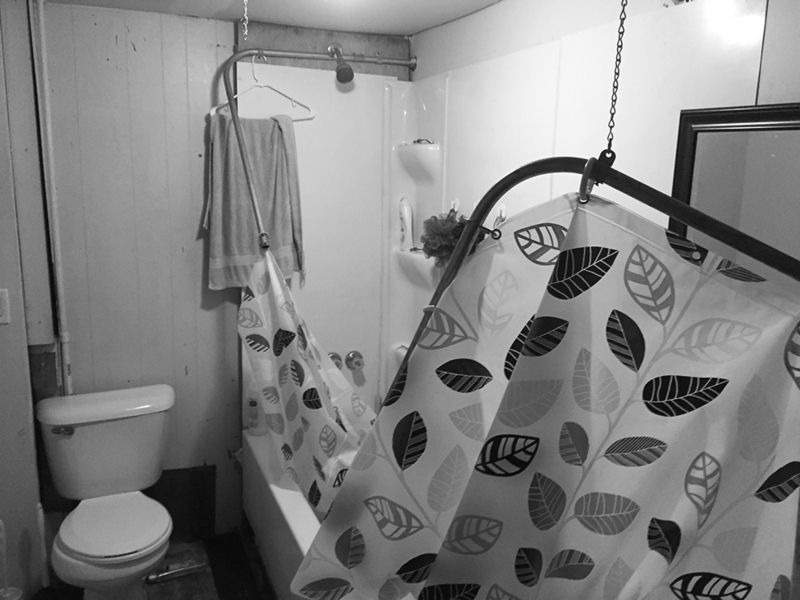 This page contains the ongoing results of interviews and photographs detailing how far too many of our neighbors are forced to live as they try to deal with landlords who’s properties are falling apart, pest infested, and dangerous to live in. The following examples are only a snapshot of a greater problem. Please contact us by email if you are interested in joining us in promoting a city ordinance to address demeaning and dangerous living conditions in our "GEM" city. June 2018: Dennis displays a rat he says he caught in his Quincy, apartment. "I was sitting on my bed watching TV when I saw one come out, and then another. When I turned on the lights, I counted at least seven of them." Dennis says he keeps dry foods in his refrigerator to keep the rats out of it, but they found a way to get in there too. Other tenants of the building shared similar stories. "I'm afraid to report this to the health department, because they might condemn the apartment and I'll have no place to go," Dennis said. Using the disability income he began receiving earlier this year, within a few weeks, Dennis manages to find a different place to live. August 2018: With a box fan nearby to keep cool, a three-month-old infant sleeps in her playpen. Not one outlet in the rental is able to handle the electrical load of even a small air-conditioner window unit. With no central air, or window unit, temperatures in the apartment reach 98 degrees. The landlord refused to install a dedicated electrical line to handle a window unit, because he didn’t want to spend the money for it. Meanwhile the family of 7 suffer through the high temperatures. 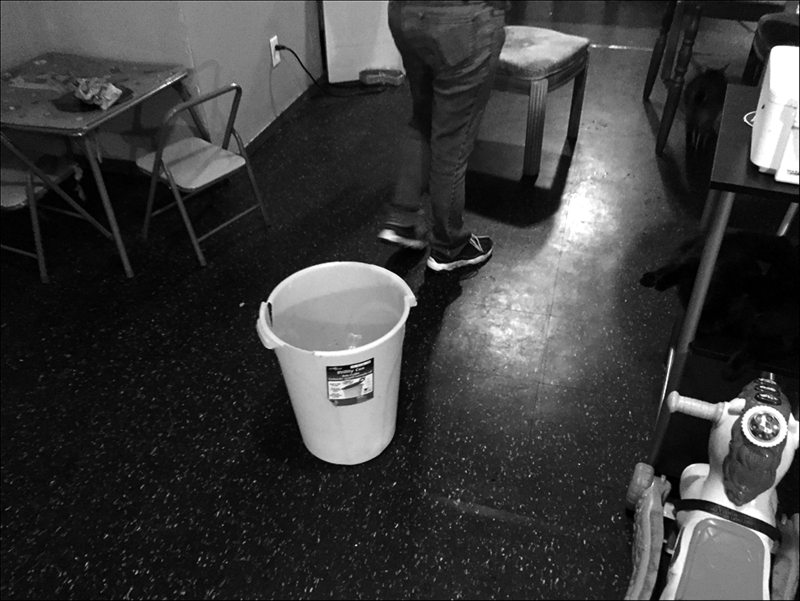 The rest of the apartment has more problems including leaking water lines, which have caused months of water bills exceeding $230 per month. With no resources to find another place to rent, the family makes due living in a dangerous substandard dwelling. In many instances, PRI programs may be more effective than complaint-based programsin ensuring safe and healthy housing, preserving housing stock, protecting vulnerable tenants, and maintaining neighborhood property values. For example, between 2008 and 2013, under Sacramento’s Rental Housing Inspection Program, housing and dangerous building cases were reduced by 22 percent. According to a study of PRI programs in five North Carolina cities, the City of Greensboro alone brought more than 8,700 rental properties up to minimum standards in four yearsunder its proactive rental inspection program (RUCO). In addition, by ensuring that landlords are aware of poor conditions before they worsen, systematic code enforcement encourages preventative maintenance, which is more cost effective than deferred maintenance, and thereby helps landlords to maintain their properties. Often, the most vulnerable tenants don’t complain. Some tenants are unaware that they have a right to safe and habitable housing. They may not know about existing tenant protections or code enforcement programs. Or they may have language barriers or disabilities that make it difficult to navigate the code enforcement system. Many tenants may be afraid to complain about their housing for fear of increased rent or landlord retaliation (such as eviction). Residents may be undocumented or have limited income that hampers their ability to move. One of the lessons localities have drawn from the foreclosure crisis is that it is crucial to prevent concentration of blighted properties, in part because poorly maintained, substandard housing can have a negative effect on neighboring property values. By addressing housing conditions proactively, and by quickly identifying and targeting exterior substandard conditions alongside interior code violations, proactive rental inspection programs can ensure that properties don’t become blighted, thereby preserving property values. From a financial standpoint, this benefits landlords and homeowners. Maintaining neighborhood property values also benefits the entire locality because it preserves the local tax base. October 2018: Yvette fills a container with water to place in her toilet, so it will flush. She says, after complaining about issues with her apartment, she received an eviction notice from her landlord. She says she has lived in the apartment for 10 years, through different landlords who haven’t made promised repairs. 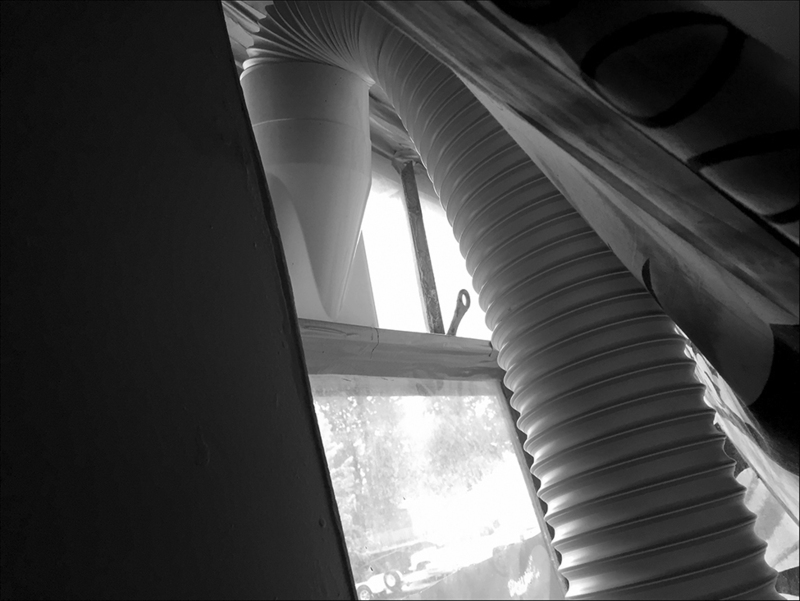 October 2018: Yvette says she has lived in this attic apartment for more than 10 years. In addition to the other maintenance issues with the building and apartment, her window has remained broken for the entire time she has lived there. She does what she can to keep the seasonally hot or freezing cold air out of the apartment through the use of plastic and blankets stuffed through the large holes. As I interview her in her apartment, the wind kicks up the blankets. October 2018: This is the view of the apartment and broken window seen from the inside. The plastic and blankets do little good, as outside air blows through the many holes. “The landlord got ahold of me saying that they had a $1,000 water bill, and they were trying to figure out what happened, so they want to come around to everybody's apartment, and put in some screws or whatever to tighten up the sinks, the toilet, or whatever. I told him that my water had drained out of my toilet. So he came the next day to fix my toilet. When I left, I assumed that it was fixed. When I came back home, like two hours later, they had broke into my apartment saying that there was feces going downstairs in the apartment downstairs, so they had to break into my apartment, and they were going to come and fix my toilet and my door the next day. They left a note on the door, saying that they would be back the next day to fix my door and my toilet, and it's still on the door. I left it on the door. They left a note on the door saying they were going to fix my door and my toilet the next day. They never did. When they came in, and broke into my apartment, I had my rent money in a container on my table. When I came home my money was gone, my door was broken, and my toilet was still not fixed. When I contacted the landlord, they said they didn't know what I was talking about, so I called the police, and made a theft report because my money is stolen. It's my rent money. The door to my apartment, I only have one door to my apartment, and they took the lock off of it to break into my apartment to stop the feces from the leaking toilet that (they caused.) They never came back to fix my door, so I went and paid somebody to fix my door. I paid $50 to get my door fixed. It is fixed because I paid to get it fixed, but my toilet is still broke, and they have not contacted me at all. I've lived in this apartment for 10 years, and I've been here through meth busts, aggravated batteries, murder, a suicide, a natural death. This is constantly chaos but this is the only place that I can really afford to live. I mind my own business. Long as the stuff around me doesn't pertain to me, I leave it at that. I have called the police several times to ask for some help about this building. The window has been broke for 10 years. I've had five different slumlords, and they've pushed it off to the next one. Somebody else owns it saying that this is what they're going to do, and it never got done, so I have to put a big sheet of plastic on the window for the wintertime so I don't freeze. It's like 15 by 25. The window has been broke in like five different places, and there's wind always coming through it at all times. Literally, I'm going to freeze if they don't fix the window this winter, and I asked them that. They're not going to so I'm going to have to get another piece of plastic to put on it so I'm not froze this winter. I have a pallet on the floor. I ride the city bus, and I got bed bugs so I no longer have a bed. I threw my bed away. This predicament, it's got me really in a jam because I planned on getting a bed before it got cold outside, and now I'm going to get evicted. My rent money got stolen, and the bed is not a possibility right now. But how can I pay my rent if my money was stolen when you all broke into my house? When they (current landlords) first was looking at the building through the bank loan, I asked him about my window. They looked at it, whatever and he said, "Well, I'll be able to do it." It's been 13 months, and my window's still not fixed. They also have a laundromat downstairs that nobody can use, and it works. That makes no sense, and I have a whole pile of clothes. I have no way to get to the laundromat. I have no car. I have no transport other than the bus, and I work seven days a week, so I wash my clothes out in the bathtub. October 2018: Among other repairs Yvette says haven’t been attended to in years is this huge portion of plaster missing from the wall in the kitchen. About the eviction notice, it was very rude. They've said they want me out, and they gave me a five-day notice. I said, "For what?" She said, "Because you didn't pay your rent," and I said, "Because you all stole it." "Well, we're going to court." We're going to go to court then because I'm not leaving. I haven't done anything. I pay my bills, and I don't understand this. This is not right. This is all I can afford. I live in Quincy for 30 years by myself with my children, and now I'm here by myself. This is all I can afford, but I do pay my bills, and I'm not leaving. We can go to court. Tenants should have rights too. Because I've went places to see about this eviction notice, and nobody would help me. That's not right because I haven't done anything wrong, but there should be somebody to protect me. For the tenants to have their own laws, and this is not right. The only laws is for the landlords. How is that right? We're the tenants, and we're ... As for the ones that are paying their bills, I need some help. I went to the circuit clerk's office to ask, "What could I do about this? Can I get a court date? Can I talk to the judge? Am I going to be able to talk to the judge because this is not right." They tell me, "No. You just have to wait until the sheriff's department is gives you your eviction notice, and you get a court date." Pastor Tony Metz has a few words to say about poverty and homelessness in Quincy. Video: Tony Metz, Pastor of Luther Memorial Church in Quincy, speaks about the proposed city rental occupancy minimum health and safety standards inspection program designed to protect vulnerable victims and combat neighborhood blight. The horrific living conditions I’ve seen in Quincy, during the past 2 years is widespread and detrimental to basic human dignity. Our director of city planning and development wrote an ordinance draft last year to combat the problem, but there isn’t enough support from the city council to bring it to the table. Please join us in supporting change. For more information, please send your contact information to: quincyilpovertyproject@gmail.com Visit the website at quincyilpovertyproject.org Follow us on Facebook: #quincyilpovertyproject Thank you. This renter, who is Afraid of retaliation from her landlord for speaking to the Quincy Illinois Poverty Project, works two jobs, roughly 16 hours a day, to make ends meet. She pays $775 a month in rent, which includes electric, trash, and water. She is a single parent raising two teenage children. She has lived in this dwelling for 18 months. She says her landlord promised the repairs would be made, but he hasn't done the repairs. She says, after repeated attempts to get her landlord to do the promised work, she has given up on getting any results. The renter says she would move, but it's difficult to save enough money to provide a deposit and first and last month's rent on a different place. Photograph details: Ceiling leak in living room, living room ceiling at risk of falling in, bucket in use to capture rain water leaking from ceiling, large hole patching job not completed, no closet doors, although renter says landlord promised doors. No ceiling above the closet. The hole goes directly to the attic crawl space, which haunts renter, because she constantly fears her cats may get lost in the attic. Large sheet rock panel that fell, yet the landlord hasn't repaired it. Shower curtain rods won't remain in place. Extension cords all over the kitchen floor to reach an outlet that works without tripping a breaker due to electrical overload. Where the living room walls meet the ceiling, poor repairs. Overview of living room. Leak in a bedroom. No closet doors her, although renters says landlord promised doors. More ceiling leaking issues. Portable AC unit. Renter says landlord says it is all that is required to cool the 3 bedroom apartment. Renter says the unit only cools one bedroom. AC unit exhaust hose threaded out of renter's daughter's bedroom. Extension cords strung across the apartment because many of the existing outlets won’t handle the proper electrical load, which is a classic fire hazard. "It's got me to where I'm scared, I'm frightened, I'm overwhelmed. I'm scared for my kids. Its not safe anymore." 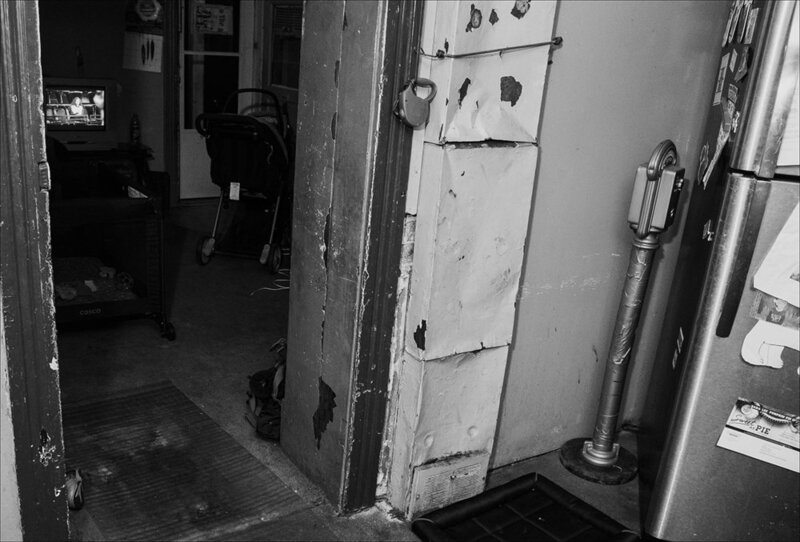 Wendy has been struggling to keep her family safe, while living in a duplex that's dangerously in disrepair. Despite repeated requests for years, her landlord hasn't made the substantial repairs to the duplex. Wendy says 6 months ago she began telling the landlord about the dangerous upstairs floor. "It's been about six months and now every month I would tell him, or every day I would text him. I'd tell him about that floor is getting weaker and weaker. The board keeps coming up. Every time you step on it, it's gonna go through. And tonight, my second oldest daughter, Courtney was helping me try to get a mattress downstairs. She stepped on that one board. It flew her right to the vent and her leg went right through the floor into the next floor below, and that is exactly where me and my 10-year-old and my three-year-old grandson, he'll hop in bed with me and he'll sleep there. So, it could have happened when we were sleeping.". 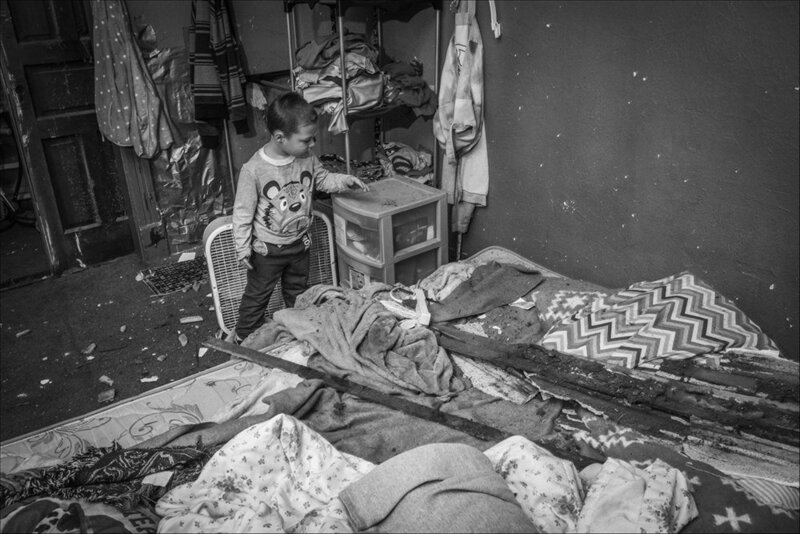 November 2018: Carson sits on the bed where nails and splintered wood crashed down upon the spot he and his grandmother sleep, after his mother fell through the ceiling, above. Wendy S. said she’s been asking her landlord to repair the dangerous upstairs floor for 6 months, but he didn’t do the repairs and her daughter fell through the ceiling, escaping serious injury, or death. “It's got me to where I'm scared, I'm frightened, I'm overwhelmed. I'm scared for my kids. Its not safe anymore. So, I just need to be done. My anxiety is through the roof. It's through the roof. The room looks like it's just like somebody dropped a bombshell and the whole thing came down. I can’t imagine if I was sleeping and waking up to that hitting you, and ... No, I just thank God that it wasn't at night. The photographs above detail some of the major repair issues Wendy says her landlord hasn’t addressed in the nearly 2 years he has owned the property. The Quincy Illinois Poverty Project has documented Wendy’s situation for more than a year and a half. "Nothing's getting done, and you just keep telling them and keep telling them and they just put it off. All they want is the rent. They don't wanna be there for their tenants. And then they laughed. They don't care. They just asked if we had somewhere to go. They didn't even wanna put us nowhere. I asked them if they could put us up in a hotel. No, just out of the room. That's all he says "Stay out of this room." See Wendy’s background story in “The Stories” drop down menu under the main navigation directory at the top of the page. July 2017: Walter, 74, cooks his dinner of rice on an open fire in the yard of the house he is renting for $400 a month. The landlord had promised the meter box housing would be replaced upon move in, but that didn’t take place. Walter, living without electricity, or gas, must cook on an open fire outdoors. This situation lasted through the entire winter. This is the condition of a rental property a local Quincy, “reputable” real estate company tried to pass off to a customer. The customer complained, asking for her money to be refunded. The realtor refused to refund the deposits and first months rent, even though the woman didn’t move into this horrific mess. The woman enlisted the help of her mother, who finally threatened to disclose the name of the realtor company and these photos on social media. Only after 3 weeks of asking and finally threatening, did she get her money back. This is another example of the issues far too many people are experiencing in Quincy. We desperately need a proactive rental occupancy inspection program to protect citizens, especially the poor and elderly from victimization. Cockroach infestation, leaking roof, and holes in floors force young woman to move from the apartment she leased for 6 months.